Winter is coming! While most of us associate this snowy type of year with the festive season such as Christmas and New Year, for mobile home park owners it’s not all happy tidings. Winter is a challenging time of year. The weather and conditions can be very hard on mobile home units as well as on the grounds of your park. If mobile home park owners don’t take the necessary precautions and properly prepare their park (and their tenants) for winter, it can lead to serious damage or consequences. In this article, we’ll run you through a list of all the things you should take care of before winter rolls in. Keep in mind that some of these are dependent on your climate and winter conditions. Ideally, you should’ve already prepared your grounds for fall. This would have kept them in the best possible condition until now which will give you the upper hand in preparing them for winter. Most of the tips will require that you repeat them throughout fall. Winter is a harsh time for the vegetation in your park and preparing the grounds should be a top priority if you want a beautiful and vibrant park come spring. The length at which you maintain the grass in your parks is of paramount importance for their health. It’s recommended that you try and keep your grass at a length of about ¾ to 1.5 inches depending on whether you are in a cold or warm climate. This is the optimal length for them to stay strong and survive the winter. It will also keep fungi from growing amid the grass. Depending on where you are located, your grass might not (or barely) grow during winter so just make sure to keep it at a good length. The less you have to mow until spring comes, the better. Mowing frequently during winter can place too much strain on the grass. Many people forget this crucial step. Fertilization may not seem to make sense if you don’t want or expect your grass to grow. However, fertilizer can still provide your grass and other vegetation with a final injection of much-needed nutrients and bio-material before winter sets in. Think of it like a bear loading up on fat for winter hibernation. Ideally, you should have fertilized your lawn before fall started. However, it’s not too late to give it a last good fertilization during fall and before winter. Use an organic product with low phosphates for the best results. During fall, and as the weather cools, you should slowly start reducing the amount of water which you use to irrigate the grounds. Instead of helping your vegetation, you might end up drowning them as the water is more likely to collect on the ground. 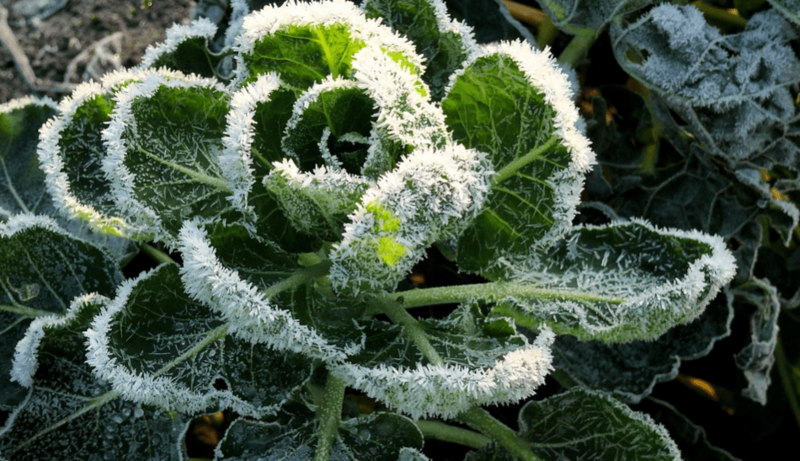 Also, as the nights are already colder, the water might freeze, harming your plant life. You should implement this advice according to your climate. Colder areas require even less water than warmer ones. If nothing else, it will help you save by reducing unnecessary water usage. Remember all that fall debris we were talking about? It’s good advice to keep stockpiling it as you prepare the grounds for winter. This collection of leaves, twigs, and other material will make great additions to your compost for feeding your vegetation in spring. Leaves and twigs stop your compost from getting too wet and moldy during winter. By mowing over them before collecting, you can chop them up into bite-sized chunks perfect for your compost pile. Although most know that stagnant pools of water are mosquito magnets, many people don’t know that mosquitoes actually breed during colder weather. Depending on your climate, this means that during fall and winter you can help prevent them breeding and multiplying. Just make sure you keep your park free of stagnant water. If you have some perennial plants around, you should keep pruning and care for them right up until winter. Make sure to get rid of any dead or dying parts. (Note: add this to your compost). For trees or woody plants, this is especially important and will help them grow faster when spring comes. Most weeds are also perennials and fall is a great time to eliminate them as they will absorb the weed killer more quickly and effectively. It’s a strategic time to take care of weeds because you don’t want them to compete with your wanted plants for scarce winter resources. Since most of your annuals will die off during winter anyways, it’s best to preempt this and put them out of their misery in fall. Once again, these make great additions to your compost pile and will help curb the spread of diseases and pests from their dead plant matter. You might also want to provide your maintenance crew with winter gear to work in the park. Consider handing out boots, gloves, scarves, and work jackets. If necessary, stock up on anti-icing or pre-treatment chemicals to keep your roads from icing up during winter. If you don’t want to use chemicals, you can stock up on salt to spread on the roads before heavy snow. General fire safety tips regarding fire alarms, candles, cooking, etc. All of this information would make up a great safety pamphlet. For fire safety specifically, you should also head over to the NFPA which is the authority on the matter. Some of the following tasks relating to the functioning and maintenance of a mobile home within the park may not be your responsibility. Whether the tenant or landlord is responsible will depend on your local Manufactured Home Landlord/Tenant Act and your park’s lease agreement. The soil contracts during colder times of the year. If the tie downs of a home are too tight, it could cause serious damage to the tie downs or the structure of the home itself. You should give them a few inches of extra breathing room to compensate for this effect. If you have any homes that will be standing empty during winter, it’s a good idea to drain the water from their plumbing and turn off the water supply. This is because water that sits in the pipes can freeze if its left unused and can cause serious damage to the plumbing system. Proper insulation has a huge role in the heating of a manufactured home. Just 5% of missing insulation can lead to an almost 50% reduction in its effectiveness. If the insulation isn’t doing its job, it will make tenants even more dependant on other forms of heating, driving up their bills and the risk of something going wrong. This is harder to check but if tenants have been complaining about how cold a home is or if that unit’s insulation hasn’t been checked in a long time, this might be the issue. HVACs or furnaces should ideally be inspected and serviced three to four times a year. It’s strongly advised that they should be serviced before winter because it’s the time of year they will be used the most. To be able to handle the increased load, they should be cleaned thoroughly and have their filters replaced. This would also be a good time to fix or replace faulty units. In many states, having skirting in good condition is a mandatory feature by law. Skirting also protects the sensitive underbelly of the home and insulates it against the weather. It will stop any unwelcome critters or pests from making it their home during winter. And it will protect the plumbing (and, in some cases the furnace and the main electrical switchboard). Skirting can be repaired or individual sections replaced. Doors and windows might seem like a small part of the home but they can have a significant impact on its overall insulation. 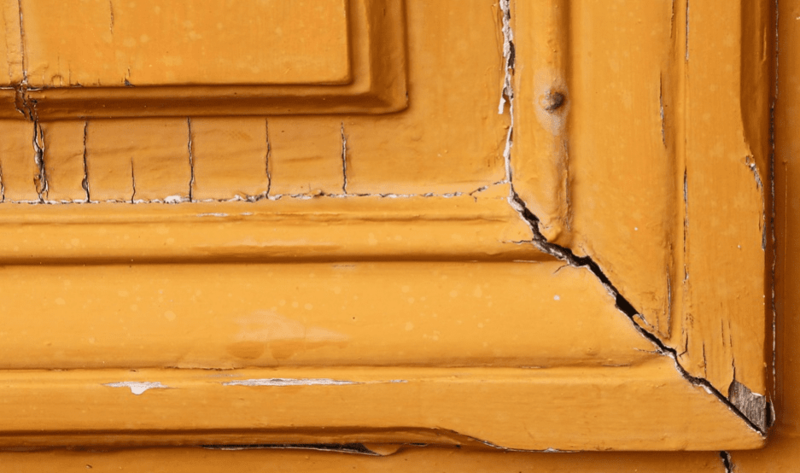 Small hairline cracks often develop in or near the rigid structures of door and window frames which leads to a leaking of air and a lack of insulation. On the outside, these can also lead to water damage and the water making its way into the wall cavities. This is an easy fix with caulk which means you have no excuse to let it develop into a serious problem over time. The roof and gutters of the mobile home units are going to come under continuous assault during winter from falling branches and collecting snow. Both need to be in tip-top shape to survive the test of winter. Hopefully, your residents have been good tenants and regularly cleaned their roofs and gutters from autumn leaves and branches. However, they should be given one last go-over just to be safe. Any existing issues, such as missing shingles or leaky fixtures should also be fixed ASAP. Don’t let your park feel the chill this winter! For more on the safety precautions to keep in mind during winter, read our article Mobile Home Park Safety | Keep Your Residents Safe This Winter. 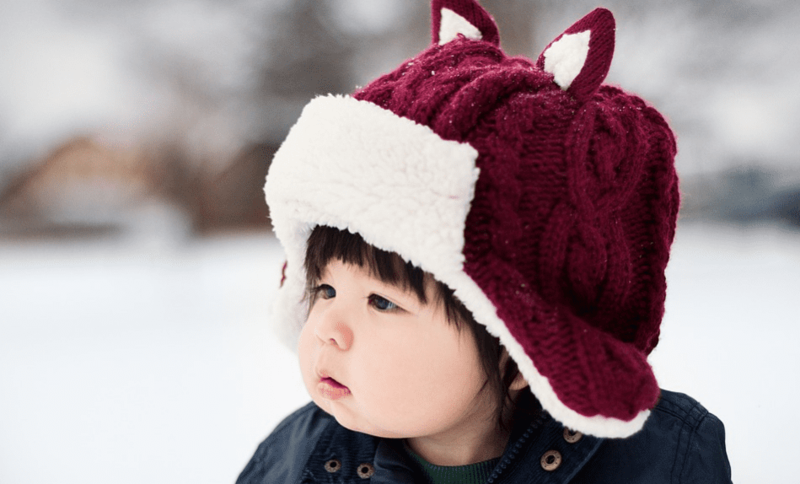 This guide will help you keep your park incident-free this winter. 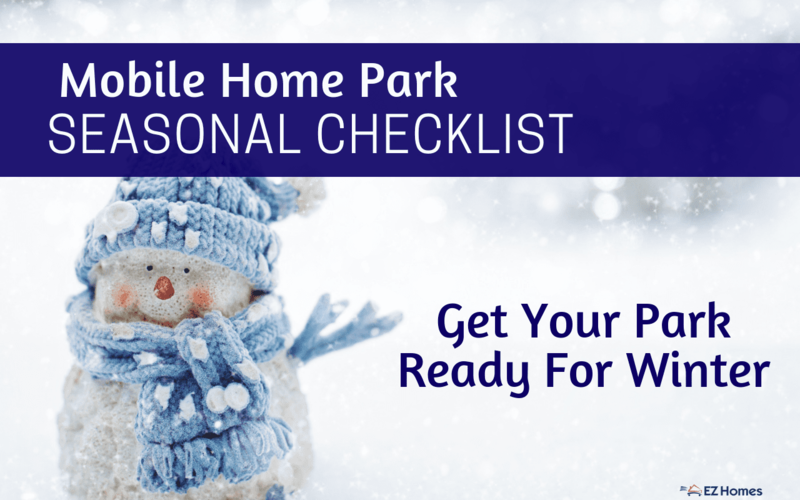 There’s quite a lot to tackle on this checklist to get your park ready for winter, so give yourself a decent amount of time to fit all of it in without cutting any corners. One last tip is to try and get your residents as involved and invested in it as possible. As diligent as you are, you won’t be able to identify and respond to all issues across your park without their help.